Picture Framing Blog - A Good Frame of Mind: So, What's With the White Roof? So, What's With the White Roof? It was a little noisy around here last month as we re-roofed our primary building here in Arrowhead Park. After almost 35 years in this location, it was time, and may I say, timely. Had we done this a few years ago, we most likely would have implemented another black roll top commercial style roofing system. After a bit of research, we found that a white roof was the most logical and environmentally friendly choice, even though we’re situated in northern Ohio. 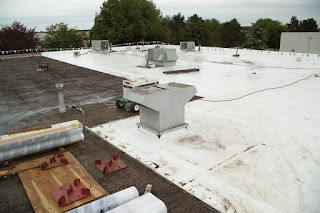 Our original thought was that a white roof would not be helpful given our long cold winters; that we would be better off keeping it black and benefiting from a net heat gain to our building environment. However, in our research we learned that the potential for energy savings is much more substantial in the summer than the winter as it takes considerably more resources to air condition a space than it does to heat it. The white roof will reflect the summer sun rather than absorb it, thus making the cooling the inside easier while preventing heat gain into the atmosphere from our building (contributing to the “urban island” effect which makes cities effectively 5-8 degrees warmer than outlying areas, make sense?). Also; something else we didn’t think about, since snow tends to cover our roof through much of the winter season, a black roof doesn’t necessarily help trap heat as it is covered in white anyways. Since it reflects rather than traps heat, the white roof will support the longevity of our building which is exactly what we need as we plan on being here for a very long time! So, it just made sense to go this route. Pretty cool, right? Whatdya know -- our rest house in Miami, FL has white roofing too! In fact, our decision to make it white was based on the same principles as you had. My wife is environmentally conscious, so she made sure that when we had our rest house built, it was equipped with energy-saving features. We've only used the house for a few times, but I can already say that the green measures we employed have paid off. No way i cant see anything here on superiorpapers com review but even with that blunder here this site is literally off the hook, great job here you guys!! I hope you fix this mistake soon though !! White roof? I am not sure it's a good idea. Read about california colleges later. You will need this info.